What's good? Suomys are generally tighter fitting than other brand helmets of the same size, but it means they don’t get too loose the more you wear them. Personally I prefer my helmet to be tight fitting. This is my second Suomy helmet and just like the first it fits my head like a (head-shaped) glove. The lining is very comfy, supportive and feels top notch. It’s not irritating like some linings can be. The vents work extremely well and are easy to adjust on the move. The locking visor means there’s no chance of it blowing open at high speeds. What's not? The visor changing mechanism could be simpler. The visor fastener on the left hand side fell apart with only the third visor change. It was easily put back together but it now comes apart most times I change the visor. For a helmet of this quality I’d expect a much simpler visor changing mechanism. 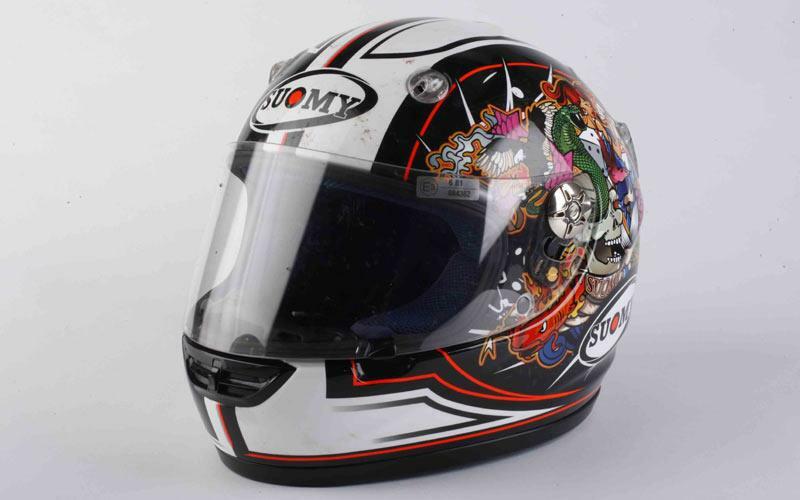 The Excel is an evolution of the Suomy 'Extreme' race lid, and is worn by 2010 WSB champ Max Biaggi. The new, £269.99 D2O is a thermoplastic flip-front that’s benefitted from wind tunnel testing.